If you’ve driven down Lake Shore Road in Grosse Pointe Farms then you’re likely familiar with the property at 423 Lake Shore Road. Lined with hedges and colourful plantings, the imposing brick and limestone mansion towers over taking in views of Lake St. Clair while holding a commanding presence on Lake Shore Road. Built in 1928, the historic residence was renovated and expanded by Detroit-based architectural firm McIntosh Poris Associates between 1998 – 2006. 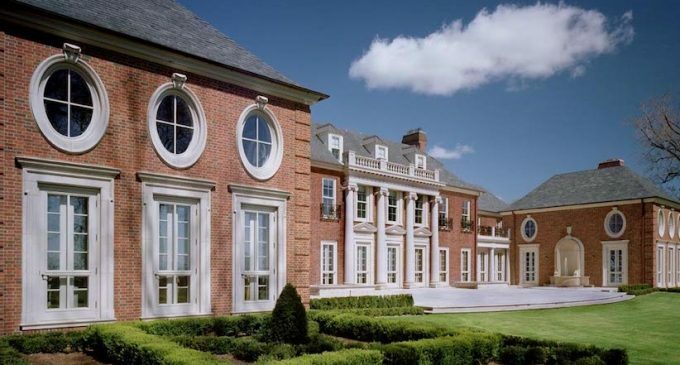 The homeowners commissioned McIntosh Poris Associates to greatly expand the already large mansion. “Taking cues from the original house, as well as researching historical precedents, the architects placed the additions symmetrically at each end of the existing structure. The “pavilion” like structures extend and sit forward of the original house, allowing for the creation of a large limestone terrace court facing Lake St. Clair.” Galleries were constructed to connect the pavilions to the original house while providing access to additional new spaces. The project won four awards including Best Traditional Interior Design, Best Overall Residence Over 4,000 Square Feet and Best Custom Kitchen. While very little is known about who owns the property or exactly how large the residence is, it’s clear McIntosh Poris Associates did a fantastic job on this expansion. The property has two access points, one off Lake Shore Road and the other on Waverly Lane. Scroll down and take a look inside. Photography by Laszlo Regos.